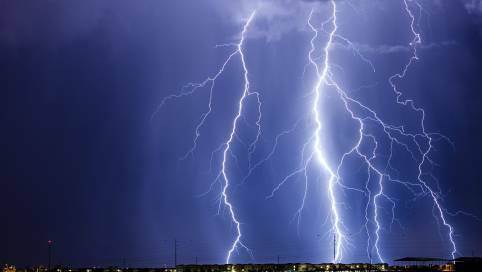 Thunder and lightning can be impressive, but do you know why they happen? Watch this video to find out. When lightning flashes and thunder crashes, it can be pretty spectacular! But here’s a curious question: What causes thunder and lightning? Inside a thundercloud there are lots of small bits, or particles, of ice and water. These particles move about and bash into each other. If enough of these collisions happen, they can make a huge spark of electricity – known as lightning. Sometimes lightning stays inside the cloud and makes the whole sky light up. This is called sheet lightning. Sometimes the lightning comes out of the cloud in jagged lines. This is called forked lightning. The lightning heats up the air around it so quickly that it causes a big sound wave – thunder! It may be exciting to watch, but lightning can be very dangerous. In fact, a bolt of lightning is about five times hotter than the surface of the Sun! So, to recap: inside a thundercloud, there are lots of particles of ice and water bashing into each other. When these collisions happen many times, it can make huge sparks of electricity, known as lightning. Lightning heats the air around it so quickly that it creates a big sound wave – thunder! Great – another curious question answered! A thundercloud contains many small bits of ice and water, which move around and bash into each other. If the ice and water bits inside a thundercloud collide enough times, these collisions can create a huge spark of electricity. This is lightning! Lightning heats up the air around it very quickly, which causes a big sound wave: thunder. Why can lightning be dangerous? How can you stay safe if you are caught outside in a storm? Complete your lesson with teaching resources on sound and energy from Tigtag.